The plan calls for more than 500,000 square feet of commercial space and 270 new housing units. The Los Gatos Planning Commission on Wednesday will look at development plans for the North 40, which is 40 acres of orchard land southeast of the intersection of Highways 85 and 17. The plan calls for more than 500,000 square feet of commercial space and 270 new housing units. But many said the proposed development is too much for the town to handle. While some said the development will be good for business, others fear it will be a traffic nightmare. "Now we're about to build a Santana Row in that area? So if you want to head to Santa Cruz on Highway 17 or try to go to a restaurant in Los Gatos, the traffic will be so bad you are not going to be able to," said Tom Thimot with the Town Not City group. North 40 is the town's last large piece of undeveloped land. The plan calls for tearing out the orchard and putting in commercial space, including big-box stores. Don Capobres, senior vice president of development Grosvenor Americas issued the following statement: "We have been working very closely with transportation agencies in addition to an unprecedented $12 million investment toward traffic and project improvements." 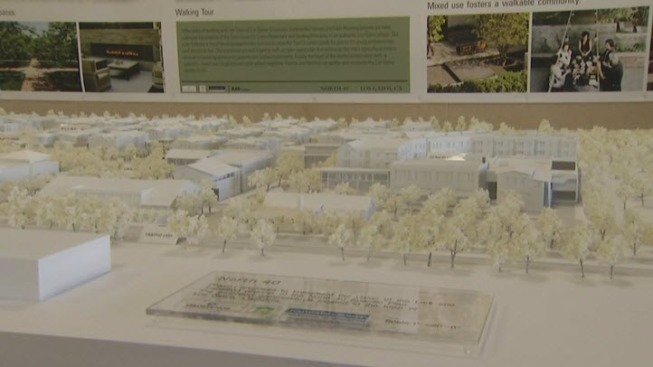 The project will also help Los Gatos meet state housing requirements, according to Capobres. A.J Cruz of Wellness Pharmacy in town believes the new development will boost business. "The benefits is if we get more customers we get bigger and will be able to hire more staff," Cruz said. With so much new housing proposed, some fear the North 40 will lead to overcrowded schools. Residents also question whether the project is consistent with the small town feel of Los Gatos. Other concerns about the project come from the Good Samaritan Hospital, which is across the street from North 40. A nurse at the hospital is worried traffic congestion from the new development making it harder for emergency vehicles to get to the emergency room.